Yes, it’s hard to believe I have never been a trip with a girl friend. It took quite a bit of memory searching to confirm that this was true. I have gone on trips to visit girl friends. I have gone on school trips that included girls who were my friends. I have met up with girl friends while I was on a trip. I have driven to visit family with female family members. Yet I have never planned, and traveled anywhere with any friend, but my husband Tom. I met a freakish number of talented, smart, stylish, easygoing, friendly people from all over. I did not drive a car, and only rode in 3 taxis in 3 days, but I was all over East Portland. There was more to learn than I could possibly absorb. I was able to support a dear friend doing something that I am scared to do. Every meal was super yummy, and I didn’t cook or clean a thing. I got to write and talk to others about their writing. There was never a shortage of adult beverages or cool people to share them with. I got to hang out with Matt Mullenweg, the founding developer of WordPress and make him laugh (at me, really). We seemed to continually be in the right place at the right time – never late, never early, and never overstaying our welcome. We bought some super cool clothing from super nice and helpful shopkeepers and paid no sales tax. There was a perfect balance between planned activities and spontaneous adventures. When you spend a weekend in Portland you spend less $$ than you would in Seattle. Everything I did was something I wanted to do. Any stuff I carried belonged to me. Pick something to focus on and dig in. Influence others in my life to do the same. Buy a bicycle and plan a day trip before the cold weather sets in. Write for 30 days straight this November. Develop a regular process/routine for promoting my blogs. Create a talk on Blogging/Wordpress/Design that I could give at WordCamp Seattle next year. Check out Jetpack.me so I can follow all the awesome blogs of the smart people I have a habit of meeting. Watch the State of the Word address. Seek out people who are making more than blogs with WordPress. Go on a trip without my family every year, preferably with a friend. 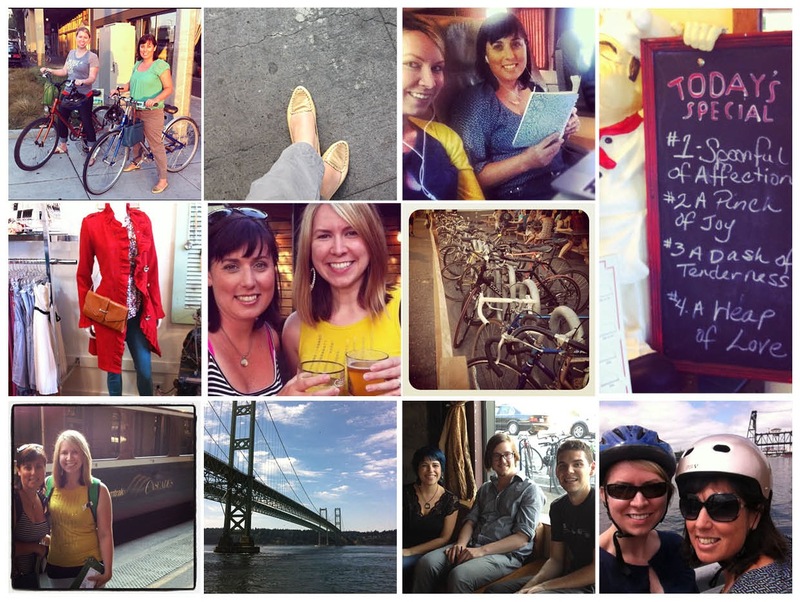 Have you ever heard of anyone going on a girl’s weekend that was so productive? This wouldn’t have happened without the inspiration of my talented and brave friend Laura. Thank you Laura for being you and for liking me enough to hang out with me for 52 hours straight. Thank you WordCamp organizers for giving us a reason to get out of town. Thank you to my wonderful husband for being a single-parent for the weekend. And, thank you Portland, for being so awesome. Thanks for coming down to Portland this weekend… it was great to meet you and I’m glad you enjoyed WordCamp. Great meeting you too Aaron. Thank you for all your hard work putting it together. I found your blog post on introverts at conferences. I loved it! This makes my heart grow three times as large! Thank you for the amazing weekend, Harmony! I didn’t realize that we were, in fact, traveling together and what a big deal that was until we were riding bikes around SE on Saturday night. This weekend felt “normal” and perfect and it was so great to share it with you, my blogging buddy 🙂 Thank you. And Laura, really I should credit you for the title. I really struggled with my title on this post, which is ironic considering how much I bragged about my title talents. Then all of a sudden it just came to me. If you hadn’t asked me if I played Words with Friends, I think I would still be struggling. Day 63: Do the challenges outweigh the opportunities? Not really. Day 88: Why I like weekdays better than weekends. Day 125: In defense of @Disney – At our house, princesses love yoga and disco.